As the recently launched iPhone X makes mobile payments even easier with Face ID, MoneySuperMarket reveals that a quarter (23%) of Generation Z predicts physical cards will soon be obsolete as mobile payments reign supreme. The new report by the price comparison website shows that contactless payments have doubled since last year, as we increasingly lose contact with cash – with 75% of people withdrawing less cash today than they did 12 months ago. The number of contactless payments has doubled in one year alone, now making up 30% of the nation’s purchases compared to just 16% a year ago, as card transactions soar to a record 1.4 billion yearly. The study also reveals that Brits now make 20% more payments with card or contactless devices (1.8 times) than with cash (1.5 times) every day, showing that mobile and contactless payments are rapidly overtaking coin and paper money as our preferred way to pay. The report shows that a quarter of Generation Z (those aged 18-24) expect mobile payments to overtake other payment methods, four times more than the over 55’s (6%). Younger people are also more likely to lose count of how many contactless payments they make, with 15% of 18-24 year olds admitting they can lose track of contactless spending, compared to just 2% of the over 55’s. According to the research, over half of Brits (53%) would react positively to the UK becoming increasingly cashless, suggesting they’d be happy with the change. 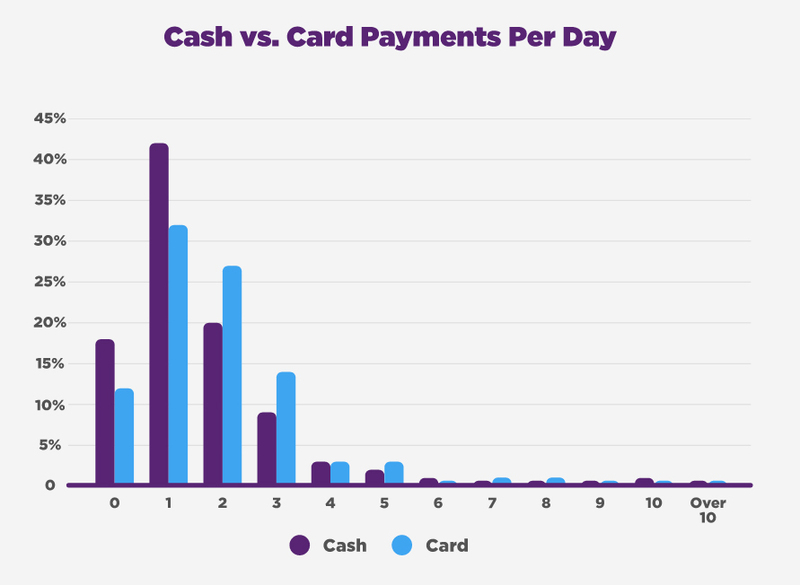 However, many of us are a little sentimental towards cash, as reaffirmed by our study, but how do day-to-day cash payments compare with card or contactless payments? On average, the study found that Brits typically make 1.5 cash purchases per day, compared to 1.8 card and contactless payments. This provides further evidence to what has occasionally been reported, that card payments have now overtaken the use of cash in the UK. As to be expected, 18-24 year olds lead the way with most card payments each day (2.3), yet they also have the highest average for cash payments when looking at age. All of which points to 18-24s simply spending more money than other age groups each day. London, the North East and the South East are showing the strongest signs of losing contact with cash, with each region showing the greatest difference between cash and card purchases. The Welsh are clearly happy and see value in both, having an equal average for each. With the huge growth in popularity of alternative payment methods such as mobile wallets (Apple Pay and Android Pay) and contactless cards, it’s not surprising that over a third of Brits have already adopted the cashless life, using these alternative methods whenever possible. The future generation is spearheading the change, with nearly a quarter (23%) of 18-24 year olds predicting that we will eventually pay for everything with our phones, rendering physical cards obsolete, as opposed to just 6% of the over 55’s. However, just over a quarter of Brits said they would disapprove of a move towards a cashless society, citing the preference to use cash “on occasion”. Even for those who approve of the move, a small proportion (17%) admitted they’d also miss paper notes.